Interior design is above all else subjective. You are always the best expert on what you love. But like all art,if you want it to sing, it must to some degree be restrained by guidelines. Too much order creates a cold stereotypical result, too little order and the risk is the junk shop look. It is at the confluence of expression and order where strong design is found. Given that your creativity is personal to you, this blog is not about that -It’s about recognized interior design principles you can express yourself within. Follow the guidelines and it will not just result in a project you love, but reward you with a few admiring glances too. Two considerations when choosing a border.Accent-color and Theme. Black border used as an accent to match handrail.But look a little deeper and there is more. The accent color is used to tie a design together. For example black border, black vase, black picture frame. Used sparingly it gives a feeling of order, understanding and peace. If its overdone it looks clumsy. It’s something people should barely notice on a conscious level. 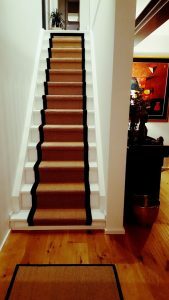 A stair runner border is an ideal start to accent. The picture left illustrates this principle. Handrail and stair runner border match in black. The books seen in the mirror also have a suggestion of black. 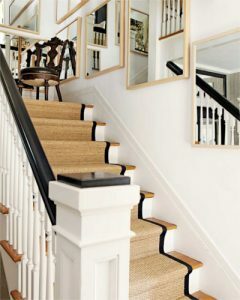 The mirror was essential as it allowed us to see the accent of black on the landing from the stairs. This is a perfect example of sparing accent use. Without the mirror image, its possible the accent would have been underdone. Had the chair been black it would have been overkill. But the designer has cleverly chosen a dark wood chair to keep an independence to the design. The Perfect balance started with the stair runner border! Ask yourself the question what is my design theme? It might be antique, minimalist , shabby chic, ultra modern or timeless? From what world is it born? May be an Edwardian library, or a sky rise apartment. Why not get an inspiration picture of that world from the internet to fix the mood. The picture to the left is an elegant example of theme created by one of our gifted clients in Switzerland. In this design the theme is born form the painting seen in the background. The painting’s glowing natural tones are reflected in the warmth of the floor and the natural stair runner. The painting is timeless and geometric, so is the design. The painting is bordered in black ,the stair runner is too, so’s the rug – just enough. There is white light within the left of the painting, there is a white background to the runner . The result is a comforting sense of order.The overall impression expresses itself as one complete theme.Decide your theme and stick to it, and your project will project that same unity born of a single, clear decisive thought. It is when these two factors harmonize you have an outstanding design.